Hello Lovely Nail geeks! I told you guys, I’ve got loads of pretties to show you this week! 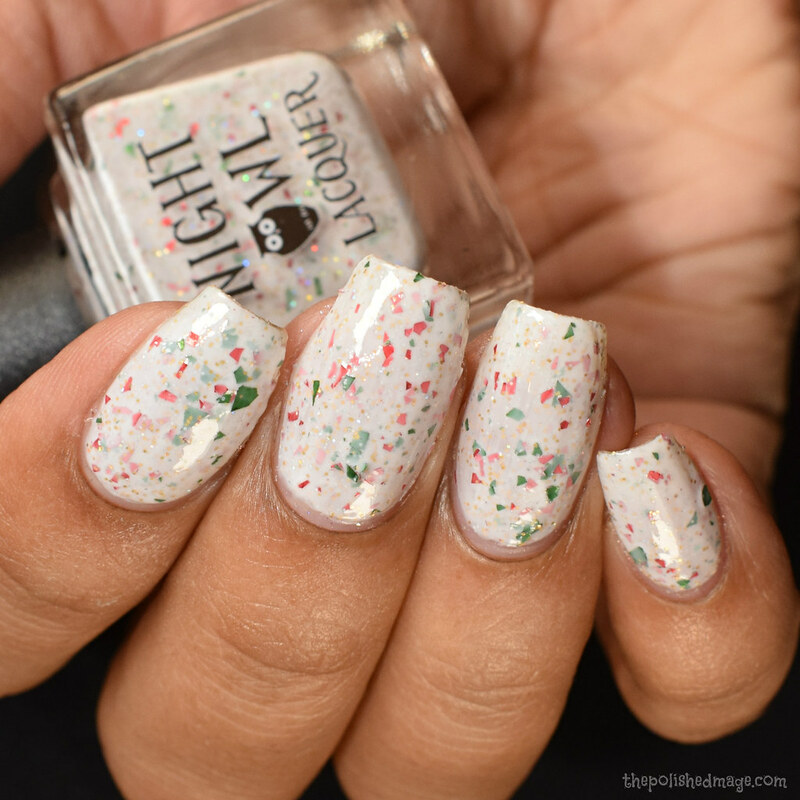 Night Owl has some gorgeous shades releasing for her Black Friday sale, along with some super LE’s that you’ll want to grab asap! There will be a Trio, holiday LE, and a doorbuster polish. Let’s start with the trio! Swatches show two coats with topcoat. 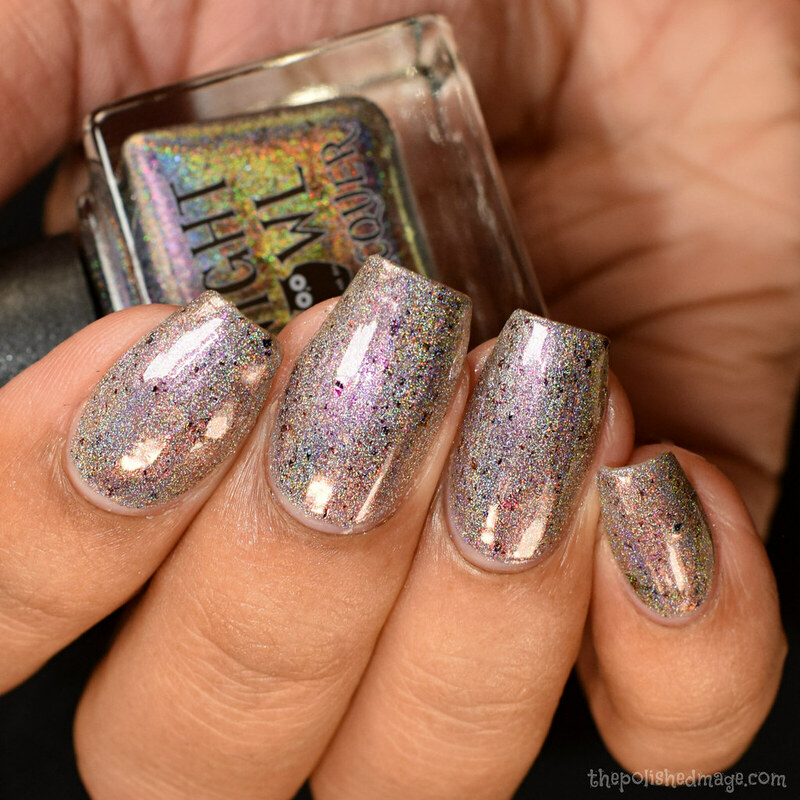 The one is so very holo! Formula feels on the medium/light side but I felt like I had full opacity at two coats. The flakes give a shifty scattered appearance and laid down flat for me during application. There is an inner glow from the multichrome pigment, that mostly appears in a pinky-purple appearance and on angles, it lights up to an orangey copper. No texture after topcoat. Swatches show two coats with topcoat. Formula is on the medium/rich side, it applied very easily and opaque. I’d describe this as a true rose gold, and the flakies give a wonderful metallic like reflective quality in the final look. 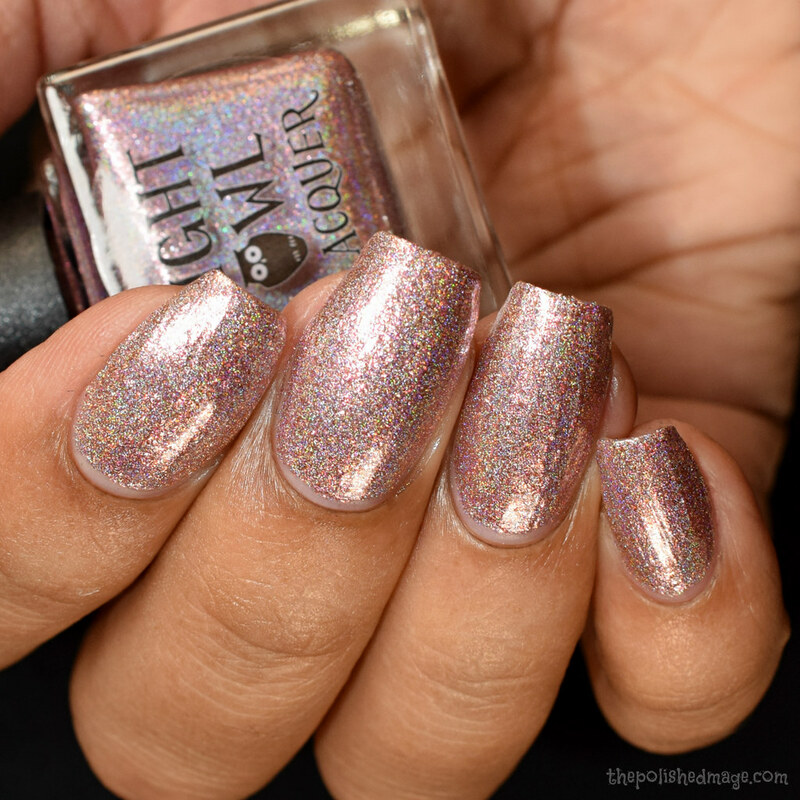 The holo is very strong and compliments the metallic effect wonderfully. No texture after topcoat. Swatches show three coats with topcoat. Formula started off a touch sheer, but built easily for me and I had full coverage at three coats. The base is a lovely cool toned, almost grey and the flakes in here give a glistening effect that makes me think of snow on a sunny morning. No texture after topcoat. 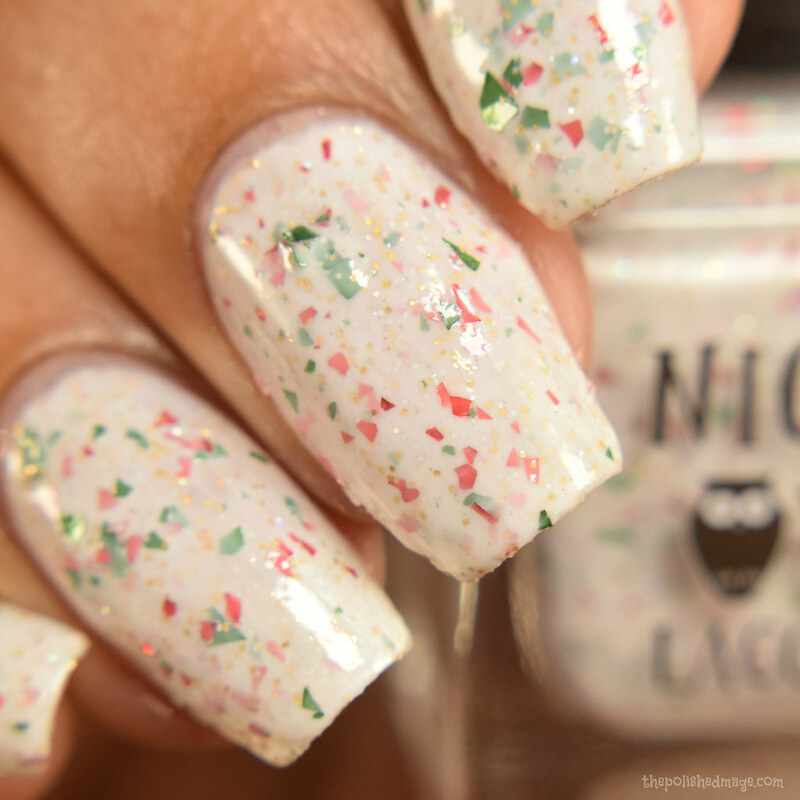 Twinkle All The Way- a white crelly with red and green metallic shreds and silver and gold galaxy holo glitters. ($6) 60 bottles available. Swatches show three coats with topcoat. My favorite type of crelly. Formula feels on the light side, but builds easily. I think in my video this one is coming off as an off white but in person, it’s definitely white. I had no issues with the flakes picking up on the brush, though I’d like to say I had one incident were a flake landed on my nail in a slanted position- I just poked it back down with the brush and I was good to go. You’ll want to go in a little heavier on your topcoat to prevent any texture. There is a lovely scattered sparkle among the flakies as well. I’m… Feeling!- a red to green thermal with bright silver flakes, blue/green/gold ultrachrome chameleon flakes, and red/gold aurora shimmer. Inspired by The Grinch, as it’s Lyndsey’s family favorite! ($11) 80 bottles available. Swatches show two coats with topcoat. 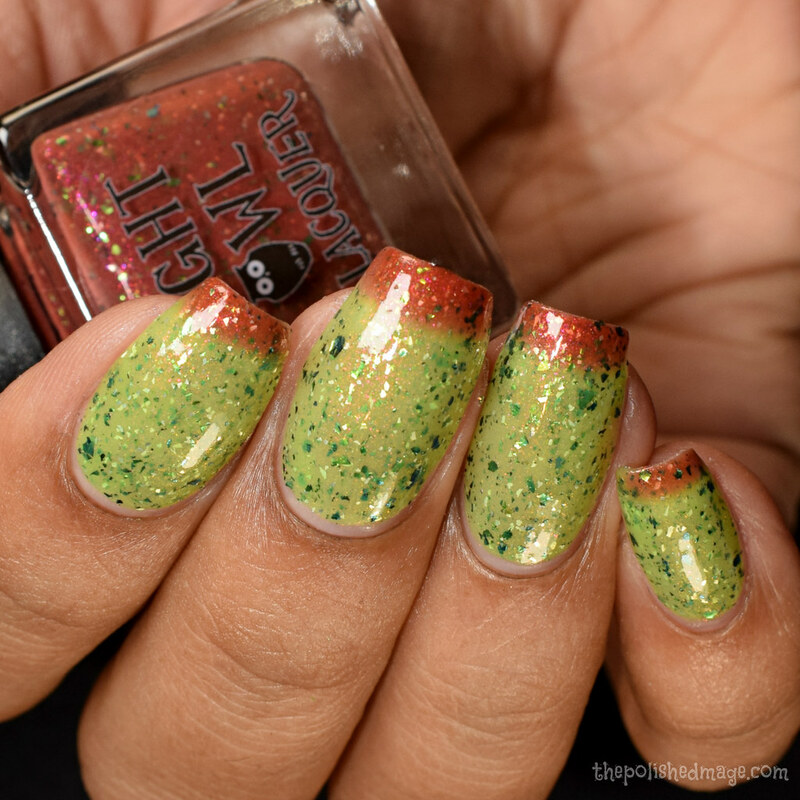 This one is so much fun, I actually broke my -DO NOT WEAR UNTIL SWATCHED- rule and had to wear it when I took my son to see the Grinch. We’re huge fans in this house so I was so excited when I saw it. Formula is on the medium side and applies buttery and opaque. I had no problems with the flakes picking up from the brush or laying down for me. After topcoat, my nails were smooth (just go in a tiny bit more than usual and you’ll be fine). Thermal properties are super reactive, in the video you’ll see it transition after the first coat. Swatches show two coats with topcoat. Formula has a super satisfying buttery feel during application, and is basically a one coater. I’d like to point out that in person it is a touch darker than what my camera picked up. Self leveling is very strong in this too.